What the HAIL was that?!? 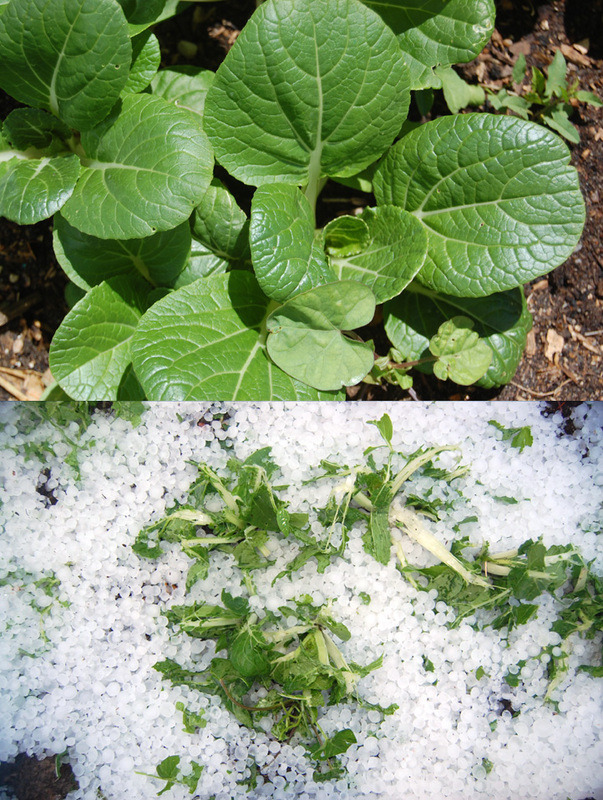 Is there life after the hail storm of the century? 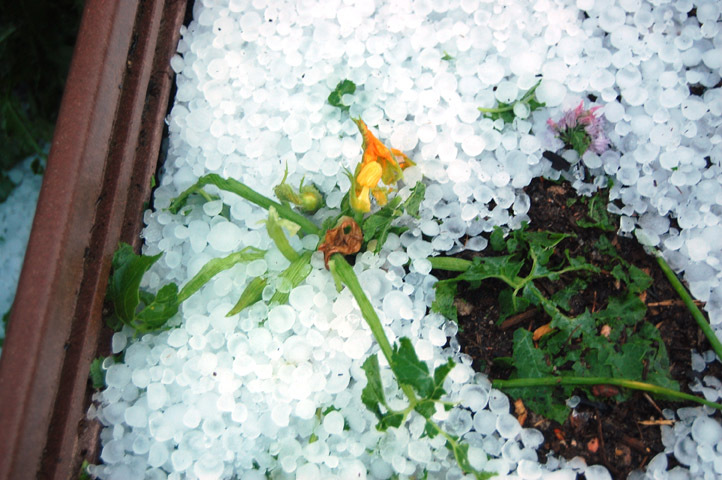 Infinitely more difficult to overcome than the dense clay soils of Colorado, hail storms are a common and devastating occurrence on the front range. Its not unusual to see an occasional pockmarked car, the hood, roof and trunk looking like lingering scars from heavy teen acne. Windshields break, windows and roofs are trashed, trees are denuded, vegetable and flower gardens are pulverized. I’ve heard of people being killed from a serious hailstone blow to the head. I guess I can’t complain. But (and to quote Pee Wee Herman, “everyone I know has a big but”) I can’t tell you how many times I’ve started plants from seeds in the dead of winter, nurtured and transplanted them into gradually larger containers, waited patiently for our last frost date (another joke), lovingly planted and finally watched with great pleasure as my garden grew. Then, just as things were looking their best, those greenish clouds would build in the afternoons. They would eventually drop, in a matter of a few riotous minutes, mothball-like ice that pulverizes and shreds everything in sight. If it’s later in the growing season, there’s little hope of recovery for that summer. A few years ago a long-time favorite nursery, Arapahoe Acres, closed it’s doors after 40 years in business due to heavy hail damage. Their retail store was on S. Santa Fe Boulevard, not far from where I live. AA sold plants, garden art, pond supplies, seeds, gardening tools, just about anything a gardener or landscaper needed. 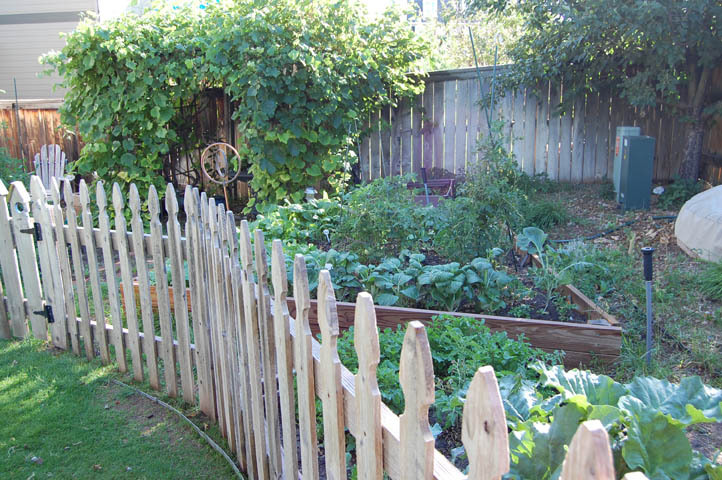 Their biggest asset was acres of trees, shrubs and other landscaping plants. They were so big they had to shuttle customers around in golf carts to shop. 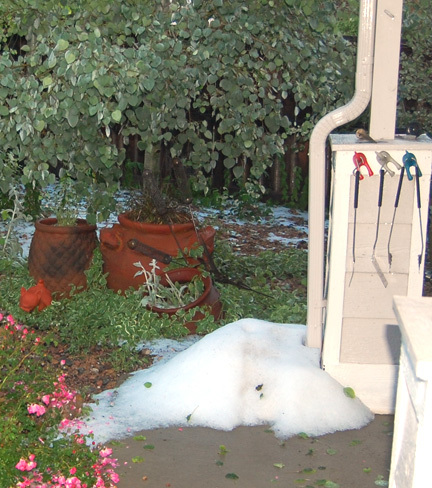 Then one of our afternoon summer hail storms wrecked havoc on their tree/shrub farms north of Denver. The damage was so extensive it destroyed their inventory for years to come. They lost heart and chose to close their business forever. Very sad. So, fast-forward to summer of 2012, Highlands Ranch CO. I’ve been very lucky for the past couple of years—hail storms either missed my garden or were mild enough to cause only minor damage. I had taken to asking Mother Nature to protect my garden at planting time, sprinkling some home-grown dried tobacco leaves as an offering ala David Elliott. But on June 7 an unheard-of midnight storm dumped hail fast and furious in our neighborhood for about 20 minutes. Our violent weather always comes in late afternoon, after the moisture buildup over the mountains finally reaches the front range and the heavy wet clouds can no longer contain their contents. Not so this time. Rare midnight lightening (so rare I’ve not witnessed it in my 30 years in Coloado) and violent thunder rocked our house. My dog was beside herself. Then came the hail—hesitant at first and then loud, hard and unrelenting—elevating in strength until I wondered if our roof and windows would survive. In the back (well, actually the front) of my mind was the thought, “crap, there goes the garden”. The storm let up about 1 a.m. and I fell asleep eventually, dreading what I would see in the morning. All downspouts looked like this. It was as bad as I expected. I looked out the bedroom window that faces our street and saw what looked like snow. The lawn was white, except for the green shards of leaves from the tree in our front yard. I went downstairs and opened the front door. The front porch planters were filled with a couple of inches of hail and a few specks of green. The downspout in front of the garage had a mound of hail about a foot tall at its base. Heading to the back yard, the lawn was covered with hail as well. More mounds of hail below downspouts. Shredded tree leaves everywhere. The garden was pretty much gone. 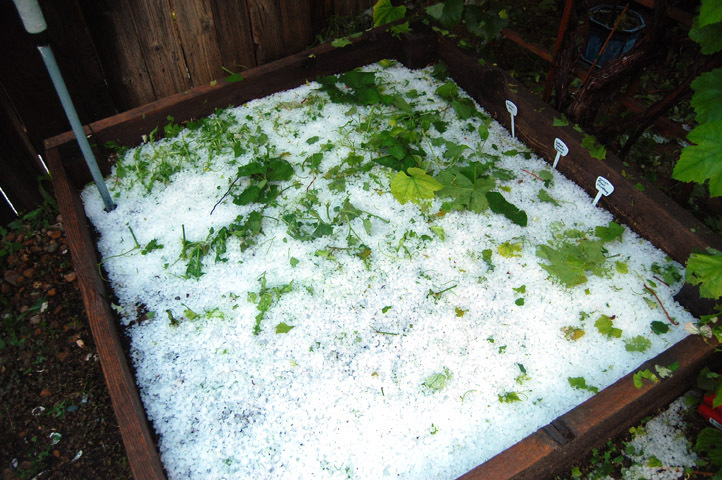 The raised beds contained about 2″ of hail, flecks of green showing here or there. The apple trees were shreaded, the apples punctured and bruised. The lilies in the pond were in tatters. Tomato and pepper plants were scrawny sticks bearing beat up fruit. Lettuce, collards, chard, turnips, squash, rhubarb, you name it, were unrecognizable. Never in my history of gardening had so much damage been done this early in the growing season. I didn’t know if I should just turn the soil over and attempt to start again from scratch, or wait a little while and see what might survive. Our growing season is SO short that there was little I could replant that would actually produce before the end of the season. The chickens, on the other hand, were gobbling up the hail like it was candy. The scientist in me decided to give it a couple of weeks before I would uproot and replant. Quite a bit of my crop had been in the ground long enough to develop a decent roots, which I felt was a key to possible plant recovery. I felt that with leafy plants such as lettuce, various greens and root plants such as turnips, kohl rabi and rutabaga, there might be hope. After two weeks things looked promising, after three weeks even more so. Unexpectedly, most of my tomato plants did fairly well. I attribute this to the fact that I had staked them very vertically and so weren’t as damaged as they could have been. 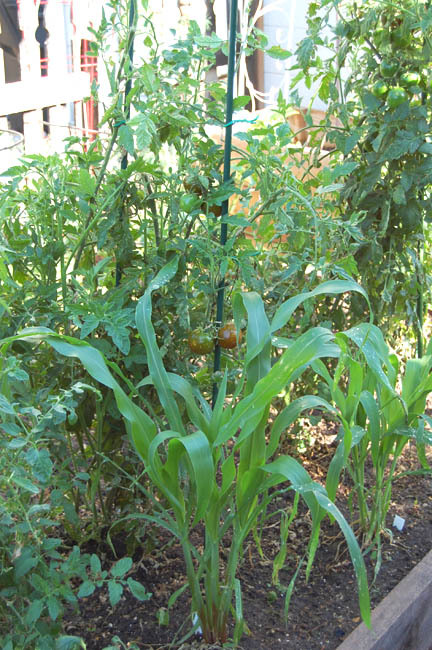 The tomatoes were so tall at planting time that I couldn’t fit them into tomato cages. I used 6′ tall stakes and plastic coated ties to secure their branches upwards. That resulted in them being more vertical, similar to bound Xmas trees, rather than their naturally relaxed horizontal state. 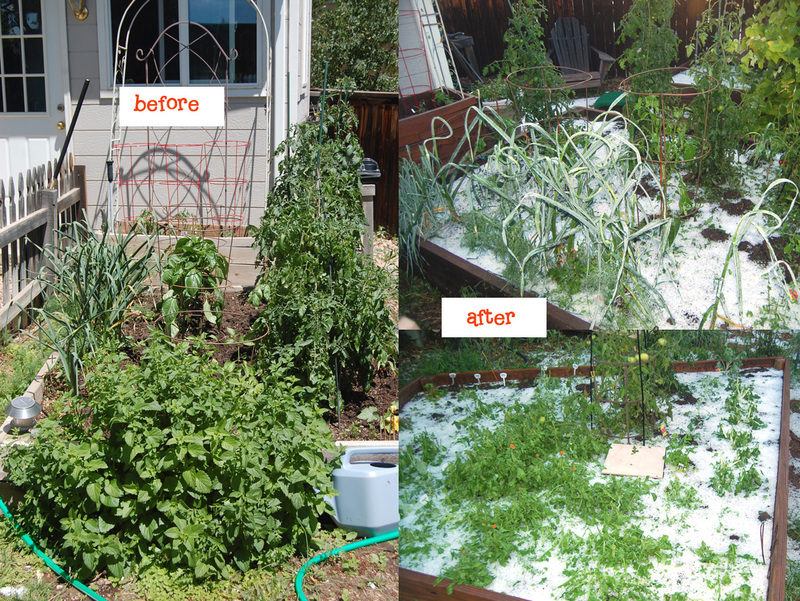 Many existing tomatoes and peppers were scarred but still able to ripen; a few leaves were not shred by the hail and so were able to provide the plants with much needed sun exposure. Pepper plants did not fair as well, but did manage to re-leaf after time and start producing more fruit. Carrots were unaffected. Even my struggling rhubarb plant managed to limp along on tattered leaves and produce some new strong ones. A stevia plant that was taken to its knees managed to rebuild itself completely. I did have to pull out a couple of tomato plants and all of the squash plants. By that time I was able to find late season substitutes that did not require a long production time to make it though what’s left of summer. I found an eggplant bush at half price that was full of fruit. Basil and parsley were planted in empty spots. A couple of store-bought almost-flowering squash plants went in too. I filled a gap with beet seeds, thinking that by fall they will have sprouted and grown. They can tolerate cooler weather. By late July the garden took on its usual overgrown, out-of-control mid-summer persona. It is not as I planned, but will still be somewhat productive. I’m glad I didn’t bulldoze. Recovery at 3-4 weeks after the storm. I guess the hardest thing about being an urban farmer is learning to deal with whatever Mother Nature dishes out. We are not financially crushed by natural disasters like commercial farmers can be. If our crops fail, there’s always farmers’ markets. But it’s so reassuring to know that the tender plants we put in the ground are sometimes able to heal themselves. As a final note, it is now mid-August my tomatoes are finally getting red. It took a long time for the plants to recover and have enough extra energy to produce new fruit. However, they are also dying from Fusarium wilt. 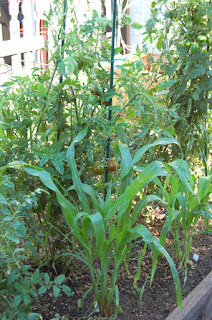 I’m not sure if they are naturally non-resistant since I grew them from seeds I saved from a Whole Foods tomato. It could be from the stress. The new squash plants are just now producing. Carrots, turnips and all greens are doing well, but the cukes and broccoli were a bust. 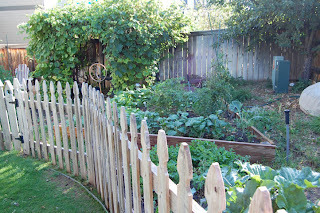 I might try to rig up a sort of net covering next spring to deflect at least some hail. 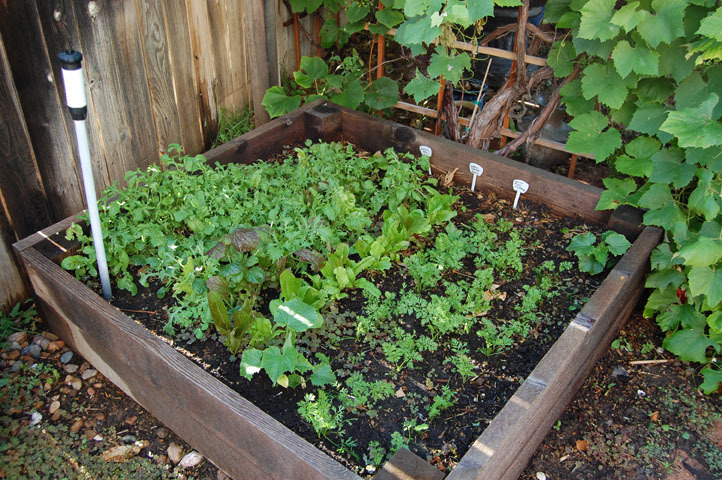 I’ll also look for VFFNT tomato seeds and plant them in my other raised bed for a change. And pray it doesn’t hail. 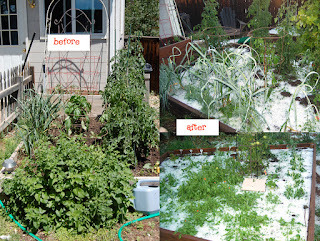 This entry was posted in chickens and hail, gardening in colorado, gardens after hail, hail damage to garden, how to recover from hail on August 15, 2012 by Farmer Deb.